Just over a year after the Telegraph became the first mainstream UK national newspaper website to go behind a metered paywall insiders say they are “encouraged” by the way it has gone. The Telegraph has declined to reveal details of the number of digital subscribers citing "commercial confidentiality". But Press Gazette has been told that take-up for full-price £9.99 a month digital subscriptions (which include access to tablet editions) has increased by 50 per cent since the paywall move. There are no details as yet on take-up of the basic rate of £1.99 to access more than 20 website stories a month. A Telegraph spokesman told Press Gazette: "We are pleased with the rate of growth for people subscribing to the digital edition. It is encouraging." The Telegraph set a 20-article on limit on free access to the site for foreign visitors in November 2012. 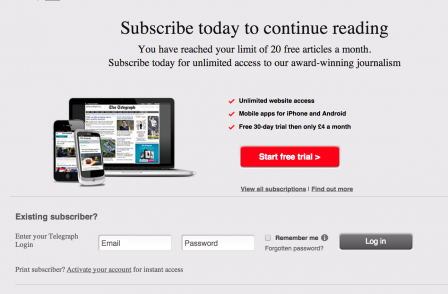 The metered paywall has been in place for UK readers since the start of April 2013. As the graph below shows, the paywall move has led to a reduction in the rate of growth for the Telegraph.co.uk – but no overall drop in numbers. Meanwhile the Telegraph’s main quality newspaper digital rival, The Guardian, has shown a faster rate of growth with its completely free strategy. 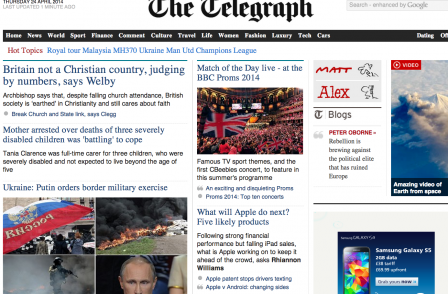 The Telegraph did however achieve its highest every web traffic last month and a return to faster growth. According to ABC, average daily ‘unique browsers’ to Telegraph.co.uk grew 24 per cent year on year to 3.5m in March 2014 and total monthly browsers grew 29 per cent to 72m. This compares with average daily browsers of 5.7m for Guardian.com (up 32 per cent year on year) and 11.3m (up 53 per cent) for Mail Online. Both the Mail and Guardian are completely free online. Press Gazette understands that the metered paywall has brought in a significant level of new revenue for the Telegraph. It is expected to report a profit of around £60m for 2013. Meanwhile, The Times and Sunday Times claim to have a combined total of around 150,000 digital subscribers. Digital content for those titles has been almost completely paywalled since the end of May 2010. The Financial Times, like the Telegraph, has a metered paywall and charges those who wish to access more than seven articles a month. It now claims to have 415,000 digital subscribers. Douglas McCabe from Enders Analysis told Press Gazette: “The fact that the Telegraph are not revealing exact numbers would suggest that they are slightly disappointing rather than really good.